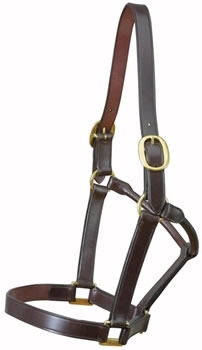 Two Buckle Leather Headcollar by E. Jeffries. This two buckle, leather headcollar for horses is made by E. Jeffries in Walsall England from best quality bridle leather. It is available in cob or full size but in havana brown with self-stitching only. Make your choice of size using the pull down menu.